Medicare serves a valuable purpose in our healthcare landscape. It provides basic coverage for people who can’t afford to buy private coverage. Young people who don’t spend much time in the doctor’s office often choose Medicare over private health insurance to save some money. For them, basic coverage might be all they need to protect against potential injury. As you get older, though, the need for private health cover increases. Doctors visits become more frequent, and you’ll start to recognise the faults in our Medicare system. Ahead, we’ll explore why private health insurance may be a suitable option for you, if you can afford it. While Medicare covers the basics, there are essential places where Medicare falls short for some people. Private health insurance offers a variety of benefits, including enhanced coverage, the ability to choose your doctor, the opportunity to avoid long wait times, and more. The government has multiple systems in place to incentivise people to buy private health insurance, as an addition to Medicare. 1 What Does Medicare Cover? 2 When Do You Need More Than Medicare? Medicare covers the essentials of health care. The system won’t make you pay for lifesaving and necessary treatment, which is extremely beneficial for those who can’t afford expensive procedures. If you’re someone who doesn’t have enough money to pay for a private health insurance premium, Medicare is a satisfactory alternative. It’s not ideal for everyone, but it’s far better than no healthcare at all. Tests that are necessary to treat illnesses or injuries: x-rays, pathology tests, etc. When Do You Need More Than Medicare? Although the above list might seem comprehensive, there are some substantial benefits that Medicare may not cover. Medicare covers vision tests, for instance, but not the glasses or contact lenses you may need once you receive your results. Wait times are the biggest incentive when choosing private health cover over Medicare, especially if you’re older. There is a long list of “elective” surgeries that Medicare will cover, but you may have to wait a long time to receive treatment. These elective surgeries include joint replacement, which is far from “elective” if you suffer from chronic joint pain. A knee or hip replacement could have you agonising for months or even a year until you finally see a doctor. When you can go under the knife, you’ll have very little flexibility regarding the timing of the procedure and where you receive treatment. One of the most attractive benefits of private health insurance is the ability to choose your doctor and the location at which they treat you. You’ll have far more flexibility with private health cover as opposed to Medicare. With private health insurance, you can make sure you receive the best care on a schedule that works for you. If you own hospital cover, the staff will treat you as a private patient in either a public or private hospital. This means that you’ll usually have a private room when you visit the hospital. Those who have Medicare alone are public patients, and they’ll almost never have their own hospital room. 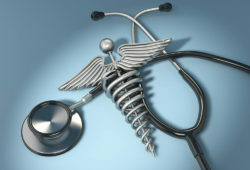 If this is an important element to you, private health insurance may be the way to go. Medicare provides health coverage for people who can’t afford to buy their own plans. Under the Australian system, the Medicare system makes sure no one is left without necessary health care. In an ideal world, only those who can’t afford private health insurance would use the Medicare system. Those who could afford to spend a bit of extra money would, leaving Medicare free and clear to help everyone who needs the support. Unfortunately, this ideal scenario is not the reality. Some people decide to use Medicare, even when they can afford private health insurance. To help dissuade people from doing this, the government offers three incentives to push people toward private health care if they are financially able. These incentives are: The Medicare Levy Surcharge (MLS), Lifetime Health Cover, and a tax rebate. Most Australian taxpayers pay a 2% Medicare Levy to help subsidise the Medicare system for everyone. The MLS is an additional fee, dependent upon your age, family status, and income. If you don’t have private health insurance and earn over $90,000 a year by yourself or $180,000 as a family, you’ll need to pay the additional surcharge. If your household income is over $180,000, but you earn less than $21,655, however, you won’t have to pay the MLS. This fee is one of the ways the government encourages people to purchase private health cover. Those who earn over $90,000 annually usually shouldn’t be adding to the already heavy Medicare burden. 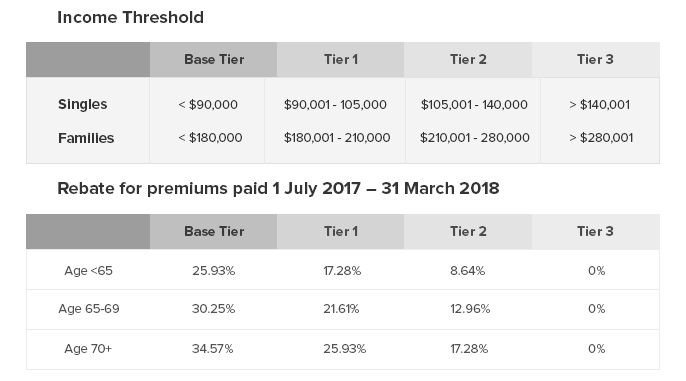 Another way the Australian government incentivises people to buy private health insurance early is through the Lifetime Health Cover. 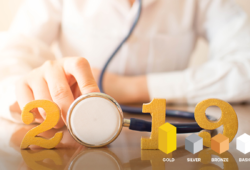 The Lifetime Health Cover starts accruing after the 1st of July following your 30th birthday, otherwise known as the Lifetime Health Cover base day. If you still haven’t purchased health insurance at this time, you’ll start building a loading fee, which you’ll have to pay for the lifetime of your coverage once you decide to purchase private health insurance. The loading fee rises by 2% for every year (after you turn 30) that you neglect to purchase private coverage. For instance, if you purchase healthcare for the first time at 50, you’ll pay 40% more than someone who bought private health insurance before they turned 30. The cap on the loading fee is 70%. After ten years of loading fee payments, your insurer will waive the fee for the duration of your insurance. If you have a substantial gap in coverage after this time, the loading fee may come back. For couples, the loading fee is the average loading fee of each partner. For example, if you have a 10% loading fee and your partner has a 30% fee, your household loading fee will be 20%. Unlike the previous two government incentives, the tax rebate is a reward rather than a punishment. 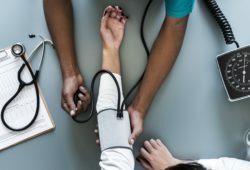 Depending on your age and income level, you’re entitled to a discount of a percentage of your private health insurance premium in the form of a tax credit. If you make over $140,000 as an individual or over $280,000 as a family, you don’t get the discount, but by buying private health cover, you’ll still be avoiding the pricey MLS. 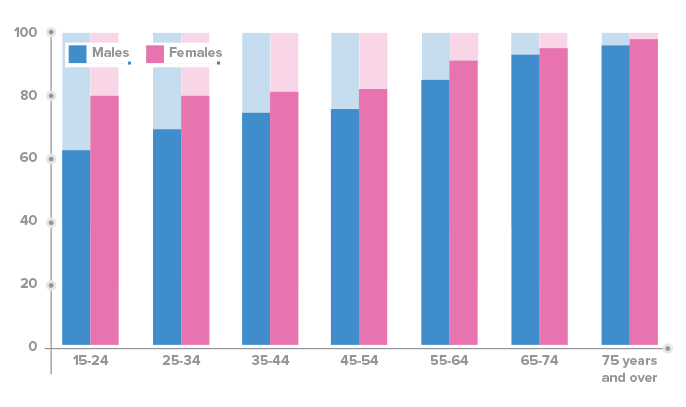 Tax rebates only grow larger as you get older. Seniors – who often need private healthcare the most – have the largest opportunity for tax rebates through this system. As we’ve discussed, relying on Medicare alone may not be ideal option for everyone – especially when you’re over 30. While it’s a necessary health care system in our country, anyone who can afford private health insurance should buy it. If you can afford private health insurance but decide not to buy it, chances are you’ll eventually pay for it in the form of loading fees, surcharges, and potentially lacklustre healthcare.